Automan.ca is about as pure a good time rock ‘n’ roll band as you can find these days. They sound like a band you might hear playing in bar somewhere on a Saturday night (this is a compliment). 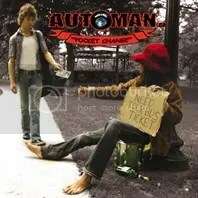 The band’s official bio states they sound similar to Aerosmith, AC/DC and The Rolling Stones and that’s about right: Automan.ca has been influenced strongly by 70s/80s blues rock & Southern rock and I would even add they sound similar to Ted Nugent (especially Darrell “Dwarf” Millar’s vocals). I don’t drink, but if I did, I imagine this in album I would do it to while sitting on a porch somewhere with my dog at my side and my woman on my lap. Just like the best women, Pocket Change is fun, fast, and loose. BTW – If Darrell Millar’s name sounds familiar, it should– he’s also the drummer for Killer Dwarfs.